This is a sponsored conversation written by me on behalf of Delta®. The opinions and text are all mine. I was lucky enough to work with Delta® for our much-needed bathroom makeover, and more recently I was thrilled that they invited me to a totally immersive design experience in New York City. Having lived there a little while back, I know how inspiring just exploring the city itself can be. I’ve done my fair share of checking out some of the city’s most creative spaces already, so I was happy to learn that the event was taking place somewhere I had yet to visit — the Cooper Hewitt, Smithsonian Design Museum. The event, which took place during National Design Week in October, was an opportunity to explore design through all senses and check out their exhibition, “The Senses: Design Beyond Vision.” Myself and a group of design enthusiasts including Elsie Larson and Emma Chapman of A Beautiful Mess and Kate Arends of Wit & Delight were reminded of how in such a technology-focused world we often forget to be physically present. The event really affected the way we discovered every piece in the museum: smelling, seeing, hearing, and touching the interactive works. Even the paper floral sculptures had a scent! The guest speaker was Bobby Berk, who you probably know from Queer Eye. My inner fan boy was screaming and yaaas, we were twinning in our green suits! Bobby and Seth (from the Delta design team) talked about how we design our homes and the impact it can make on all our senses, through the feeling of a textured spout or simply touching a faucet. 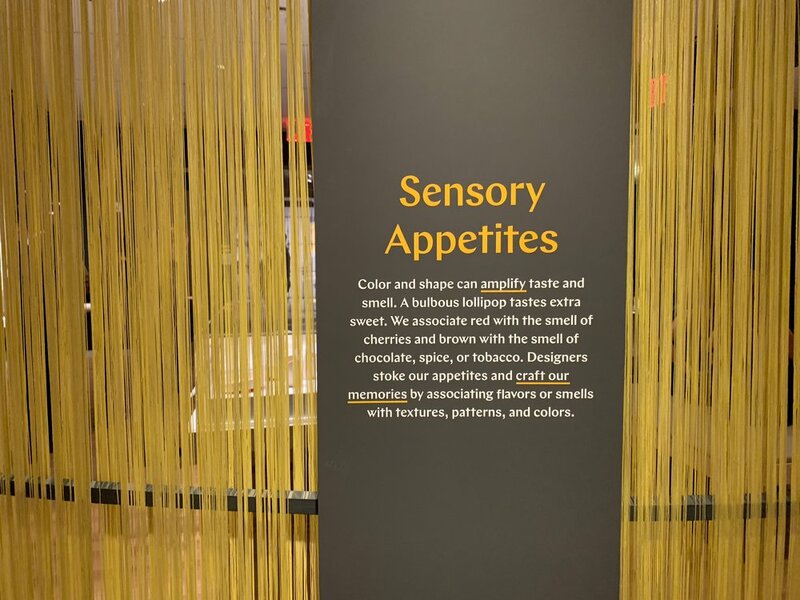 And that we should really cultivate all our senses when designing a space. Definitely something I will remember to do on the spaces I create. I love that Bobby also shared how he loves designing with textures using hard and soft surfaces to create a harmonious space. But of all the design-related things to see, one of the most exciting aspects was getting to experience the reveal of a Delta® conceptual design. Avvalo is a futuristic faucet but was actually inspired by Renaissance art! At first I was like whoa, what in the world is that? It was completely unexpected and that’s what design is all about — pushing boundaries. The faucet was the perfect combination of modern and classical aesthetics, which speaks to everything I’m about. It’s sculptural. It’s also touch-sensitive so it’s tech-savvy but it also offers such a tactile experience, with the natural flow. Getting a sneak peek of the concept, as well as getting to chat in depth about our need for a more 360 approach to design left me with a renewed spirit, as did getting to connect with such a great group of talented and likeminded design folks. Not only did this experience help to inspire the way I'll continue to renovate my home, it’s also giving me a little boost in all my creative pursuits. This is a sponsored conversation written by me on behalf of Delta Faucet. The opinions and text are all mine.